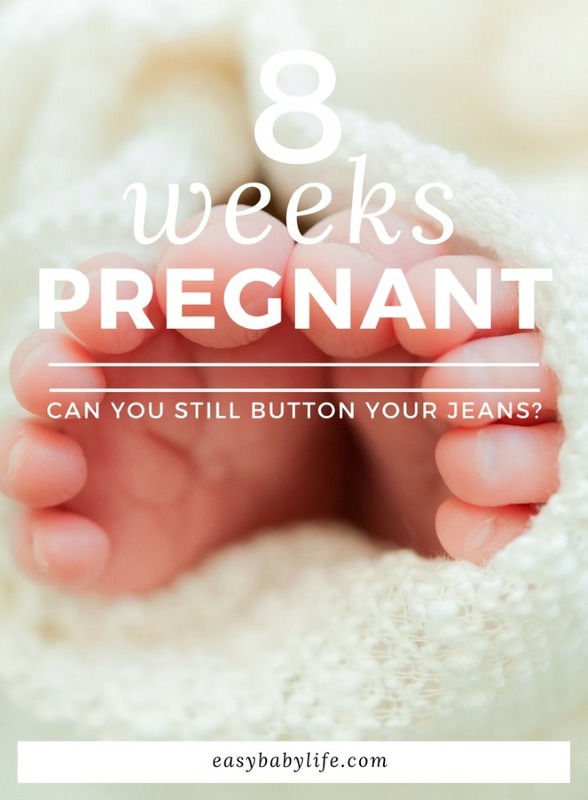 Being 8 Weeks Pregnant - Can You Still Button Your Jeans? Home > Your Pregnancy > Pregnancy Week By Week > Being 8 Weeks Pregnant – Can You Still Button Your Jeans? 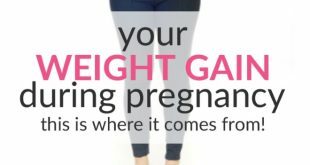 Being 8 Weeks Pregnant – Can You Still Button Your Jeans? When you are 8 weeks pregnant, your baby’s heart has already been beating for 3 weeks and his or her toes and fingers are being formed, as you can see in the photo below. 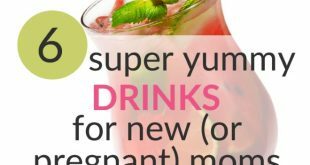 Your uterus is expanding rapidly, which may lead to some cramping. Mild cramping is normal, but if you notice any bleeding, contact your health care provider! The fetal age of your baby is now 6 weeks. 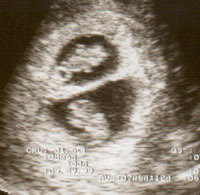 This week, an ultrasound would reveal if you are carrying twins or not – as in the picture to the left. Only 1 in 60 are twin pregnancies, but heredity and mom’s age may increase your chances of a twin pregnancy. Your first ultrasound scan will let you know. A fascinating milestone this week is that it is now possible to register brain waves in your little embryo. The little one is now the size of a pinto bean or a raspberry, measuring around 0.6 inches (1.6 cm) in length. He or she weighs a whopping 0.04 ounce (1 gram). Although this may not seem large even at 2 months of pregnancy, your body is rapidly expanding to try and accommodate the growing child inside of you. As the eyelids and ears are still forming, the eyes are still placed very wide on the sides of the head but will center themselves out in time. If you had the opportunity to peer inside of your uterus, you could see even the tip of the noseB beginning to form. Just last week your baby was more primitive and with each passing week, it is starting to take on a more human-like form. Fingers and toes have now begun to branch off of those arm and leg buds that have been developing these past few weeks, even though you would see more of a webbed look to them for now. Both the arms and legs can extend forward and bend at the elbow that is also now present. Your baby’s torso is expanding and straightening out in order to make room for all of the activity that is going on. The tubes that lead from the throat to the lungs branch out and the chambers of the heart are now visible with an ultrasound. You’ll find a number of great fetal development videos in this post. Eating healthy at this time of pregnancy will help your baby develop well both now and in the future. To learn about how to eat to promote your baby’s health, click here. 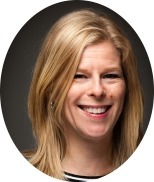 8 weeks pregnant, it is perfectly normal to feel moderate cramping and discomfort from your expanding uterus, but if you start to notice vaginal bleeding, be sure to seek the medical advice of a professional. Mild spotting can be perfectly normal, but if it persists, it could be a sign of problems. You are probably aware of the risks of miscarriage during these first several weeks of pregnancy, but actually, if a live embryo has been seen in an ultrasound at around 8 weeks pregnant, the risk of miscarriage is significantly reduced. You might be able to notice a slight difference in how your clothes fit now. Exciting! Even though you can still probably fit into that favorite pair of jeans they may be snugger and you won’t be wearing them for much longer. By strategically dressing, you could probably still hide the small life growing within you if you are still unsure about letting the world know of your exciting news. But it certainly gets more difficult with every pregnancy for most moms. 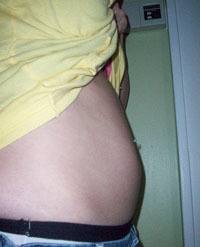 The stomach muscles are more stretched in your second pregnancy (and on), and the baby bump is likely to show earlier. Your pregnancy can affect many decisions that you have previously not considered, such as taking holidays. Vacations out of the country have a tendency to require immunizations, and some can be harmful to some expecting mothers. Be sure to check with your medical provider before planning any long trips to avoid any unnecessary health risks. I’m beginning to be very tired and nauseated in the evening. (Morning sickness – who came up with that name.) Frying food makes me feel like throwing up. My stomach is kind of large and bloated. But none of this is really important because two days ago I had an ultrasound… I’ve seen my baby! It made me cry. 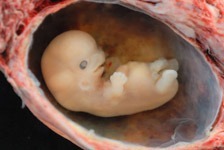 A tiny little embryo with a beating heart. Such a miracle! Are you also 8 weeks pregnant? Please share your experiences and thoughts by leaving a comment below!